I watched the Scotland game against France on the Newcastle Falcons team bus last week and at the end of the game Greig Laidlaw was speaking to his team in a huddle on the pitch. At the end of his chat there was a ripple of applause from the players and the cameras moved off them. I presume the applause was for Sam Hidalgo-Clyne winning his first cap but one of my smart-alec English chums laughed and said: "Is that them applauding themselves for at least making a close game of it?" Yes, they lost both games, the latter by 26-23 at Murrayfield, but as Greig Laidlaw said in the post match interview, "Rome wasn't built in a day." They are improving, gelling and, crucially, learning. There will be inevitable chat about - the talking points will include the two yellow cards and the time-keeping at the end of the game but I'll leave that discussion for the moment as I'm sure everyone has their own opinion. For me, the two yellow card incidents merited the same sanction, but I'm just not sure if they should have been yellow cards. The Rhys Webb try for Wales was brilliantly taken, his positive support line up the middle was beautifully read - as Hidalgo-Clyne replicated later - but could Scotland have done better? I'd say an emphatic "yes". When Wales won the breakdown on the halfway line only Laidlaw was on the ground, having made the tackle. Blair Cowan was making his way back into the defensive line on the open side but there were 12 men on their feet and they should have dealt with the Welsh attack. By the time Jake Ball took the ball at first receiver it really should have been a controlled five-v-five situation with Stuart Hogg working hard in the back field but Rob Harley tried fixing the problem by himself by coming out of line. Mark Bennett found himself in no-man's land and the space was created for Liam Williams. From turnover ball the key is getting back into shape as quickly as possible and if that means conceding a few yards then so be it. I understand why Bennett tackled Jonathan Davies, believing he was being impeded - I've done it to a referee - and it's a split-second decision, but let's say for arguments sake that he just continued to track back, covering Davies should he receive the inside pass. Hogg then takes ball carrier, Williams, and Bennett is on his feet to block the inside pass and potentially the try isn't scored. Lots of "if's" and "but's" but my point is that from the turnover ball there were a number of different little things that Scotland could have done to prevent the try being scored. At least Webb is in my Six Nations fantasy team. 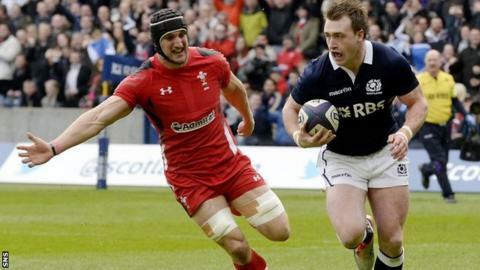 Scotland matched Wales in many areas of the game and were incredibly impressive in the scrum. I've not seen a Scottish pack dismantle a Six Nations opponent in the scrum, like on a few occasions on Sunday, in a long time. There were three key differences, though: the aerial battle, speed of ball in the opposition 22m and being clinical when opportunities arise. Leigh Halfpenny, Williams, Dan Biggar and Alex Cuthbert consistently suppressed pressure by taking defensive high balls but also created pressure and won territory by re-gathering their own kicks. Re-gathering kicks also means that you are attacking against unstructured defence. Wales were still able to create momentum in Scotland's 22m area, having the ability to get their power runners on the ball at the right time and looking slightly more organised. Scotland just need to vary their attack a touch more in the 22m, trying to get the likes of Bennett, Alex Dunbar and Hogg on the ball, because they're causing the opposition plenty of problems from further out. This takes us on to being clinical. There were three clear-cut times when one more pass would have ended up with a Scottish try: Dunbar's break, Hogg's break and Hidalgo-Clyne at the end. With this back line you can afford to gamble on support lines, predict the line break and play in front of the game. A number of cracking individual performances again, but special mention to Alex Dunbar who I thought was Scotland's man of the match. He carried hard, was outstanding in the defensive line and like a limpet in the contact turnover. Russell, Bennett and Hogg took the headlines last week, add in Dunbar this week and you can see why the Scottish crowd are getting excited whenever the backs get the ball.